This post is at risk of becoming a rambling mess. But, I'll do my best. First, we've been neglecting the blog for the past week or so. Not because we don't want you to keep up with our adventures, but because we've been busy, busy, busy. 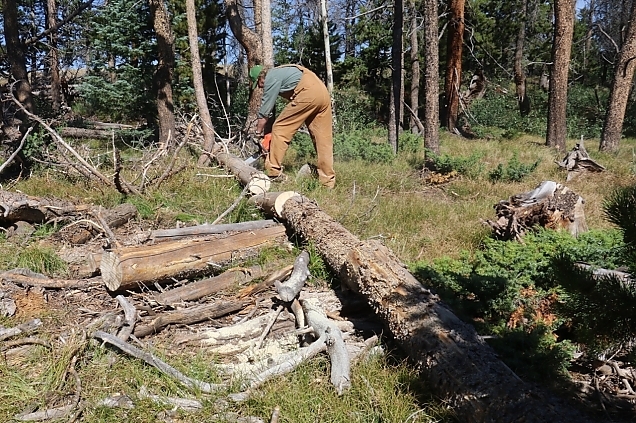 We cut wood on Labor Day, but did not make as much progress as we hoped. It seems the "sawing" part was becoming more and more difficult. On Tuesday, we took Destin to the vet to get his rabies shot, and had to leave him there for a while so they could work that last minute request into their schedule. We drove in separately, me in Big Red and Lynne in Lex because Big Red was headed in to service (again). 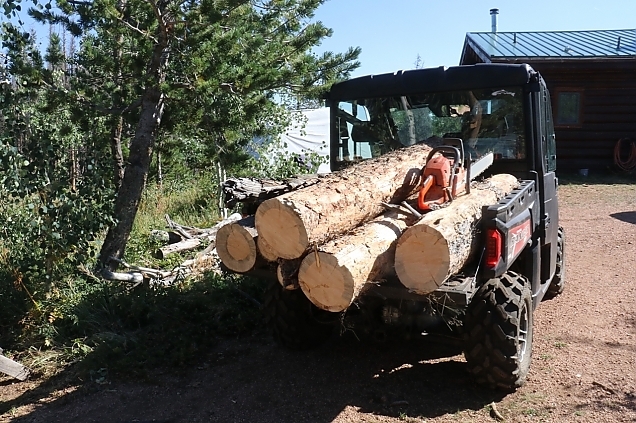 On the way, I stopped at the Saw Shop at Heggie Logging Company to drop off a chain saw chain to be sharpened. I figured that might be the problem with our sawing troubles. Sure enough, John took one look at the chain and decided I needed some serious saw maintenance lessons. 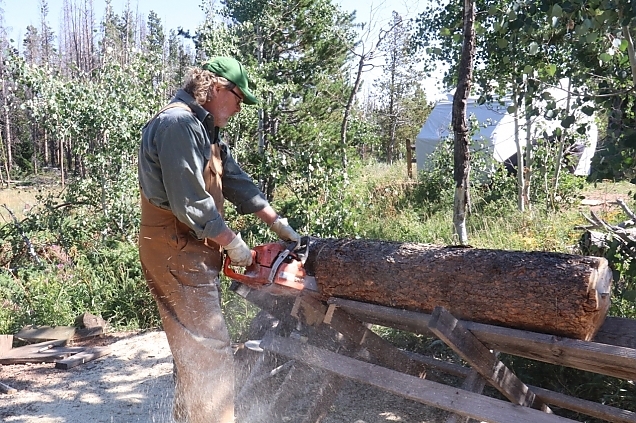 John kindly and patiently showed me why my saw was not cutting very well, and why, when it did cut, the cut was not straight but rather curved downward through the wood. (One side of the chain is more worn than the other and not all the cutting teeth are the same size and sharpness.) The chain was in serious need of reconditioning. 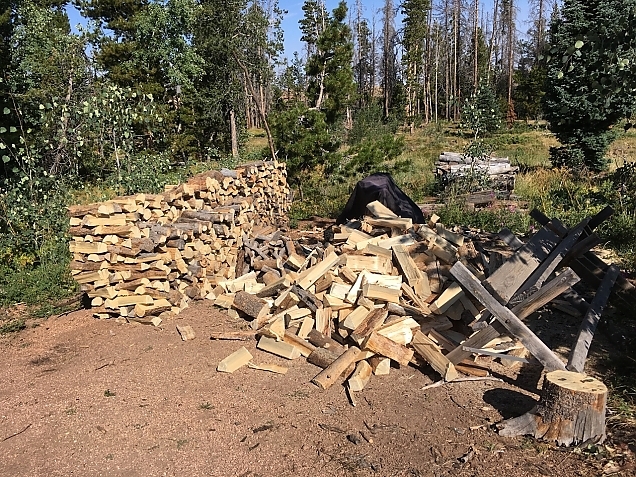 He went on to show me the proper way to sharpen the cutting teeth (which I pretty much had down), but also how to test the height of the rakers and file them to the right height. I'm not going to go into how a chain saw works, so you can look up these terms on Wikipedia. John also showed me how to change a chain. (I actually have a new chain that I've never used.) 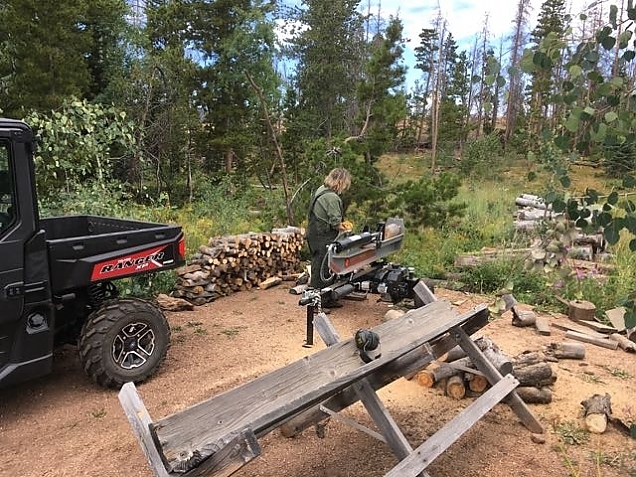 Later, when we finally got home, I put the new chain on the saw, and wow! does that make a difference. I think sawing will go back to being fun now. I left the old chain with John to be reconditioned and I'll pick it up in a few days (and take him the chain from my second saw). So, back to our Tuesday: dropped off dog, learned a lot about chain saws, dropped off Big Red to get the blower controls fixed, shopped at WalMart, picked up the dog, took the dog to ACE Hardware to pick up some paint for the shed, and came home. It was a longish day and Destin got some experience riding in the truck. He really likes it when we pass by cows. Wednesday, we got up at 5:00 a.m. and headed out to pick up our new refrigerator and stove at a propane supply place in Longmont, Colorado. Destin went with us. 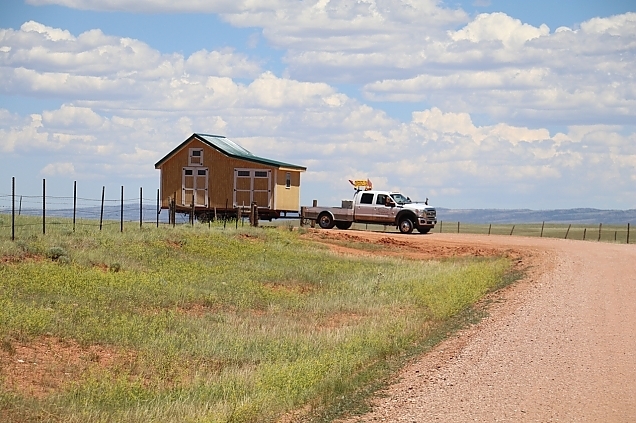 We had hooked up to a borrowed trailer the night before, so we got away from the house about 5:40. It was just a little less than 3 hours to make the drive. We got the new appliances loaded in the trailer and headed back. I decided to take back roads rather than go all the way back out to I25 and up to Owl Canyon Road where we could cut over to Highway 287. Let's just say that a tall refrigerator, tied down to a short trailer on some of the more "curvy" back roads led to a few moments of panic (only if I looked in the rear view mirror). But we made it home okay. A long day, but we still needed to unload the appliances and get them inside in case it rained. That was a bit of a challenge, but between Lynne, me, a hand cart and some ramps that I borrowed, we got it done. Destin was one pooped pup. 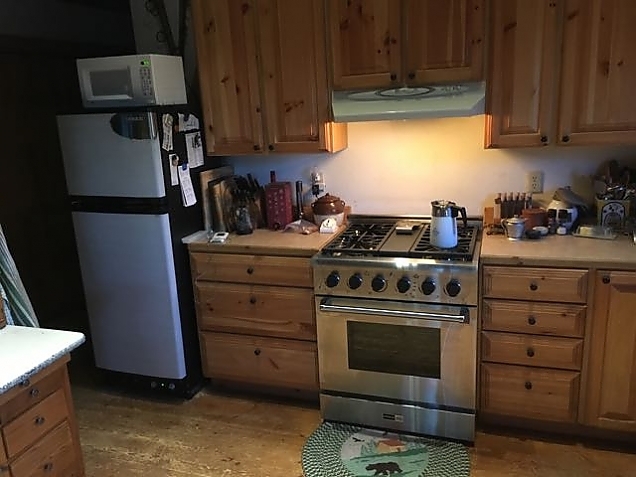 Why new appliances? We were really tired of cooking on our antique Amana range. The burners (of which only 3 of 4 worked) had two settings: high and off. And, we need a second refrigerator. So, the idea was to get a new range and refrigerator, put them in the cabin, put the old refrigerator out in the shed as a second fridge, and donate the Amana range to a charity that can fix it up and use it. 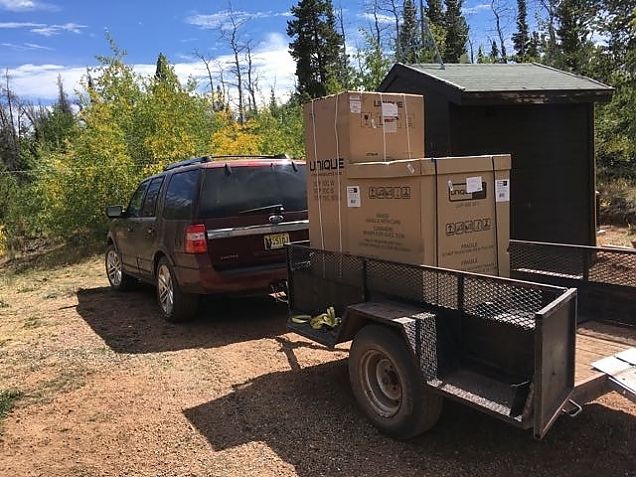 We did a lot of research on propane appliances and decided to get the new ones from Unique, a Canadian company that provides high-end off-grid appliances. We could only get them from dealers in the US and the two closest were in Rawlins, WY or Longmont, CO. Obviously, we went the Longmont, CO route. On Thursday, Tim from Suburban Propane in Laramie came up to install a new 500 gallon propane tank and plumb it to the propane generator. (Yeah, we are still working on getting it fully commissioned.) While here, he helped us install the new appliances. The range went in reasonably well. It "just fits" and I think I need to plane the sides of the cabinets some to get it further back by about 1 inch. And, it works great. I think we will love it. The refrigerator is another story. We got it hooked up, and while it is a bit taller and deeper than our old one, it fits okay. The problem is that we simply could NOT get it to light. To light a propane fridge, you need to press on a button that allows the flow of a small amount of propane to a starter burner (a pilot light, of sorts). Then, you press another button at the same time that creates a spark to ignite that propane. As long as you hold in the first button, it will burn. As it burns it heats up a sensor that eventually will open the flow of the main propane source allowing the fridge to work. Well, on ours, that sensor must not be working. No matter how long we held in the button, when we let go the pilot light would go out. When I woke up on Friday morning, I was a bit shocked to see that the batteries were down by almost 300 amp-hours. Normally, they are down about 100 amp-hours from overnight. (For the geeks, that is 300 Ah at about 25 volts average, so roughly 7.5 killowatt-hours.) They got (almost) a full charge on Friday while we were at a dog show in Greeley, Colorado. While at that dog show on Friday (and that is a whole different post, but the third day with Destin on-the-road), I called Unique and eventually spoke with their support guy, Tim. He seemed to think I am suffering from a problem they've seen before that could be the result of poor grounding, or insufficient microvoltage to the whatchamacallit, or a a bad thermocouple, ... He sent me "detailed" troubleshooting and repair instructions by email that I was able to study once we got home. Hmmm, seems I have to tip the refrigerator on its side to get access to all the gadgets I'm supposed to fart with. Emptying the fridge again is not a big deal. But, the propane tubing isn't long enough to allow this. 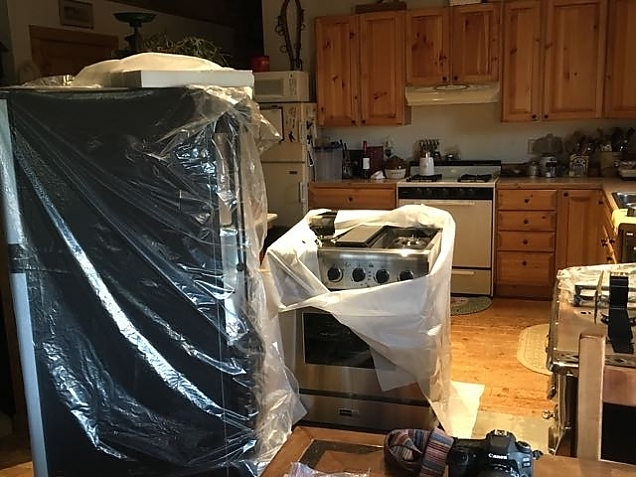 So, I'd need to disconnect the propane supply, tip the fridge on its side. Fart around with various components looking for shorts and microvolts, etc. 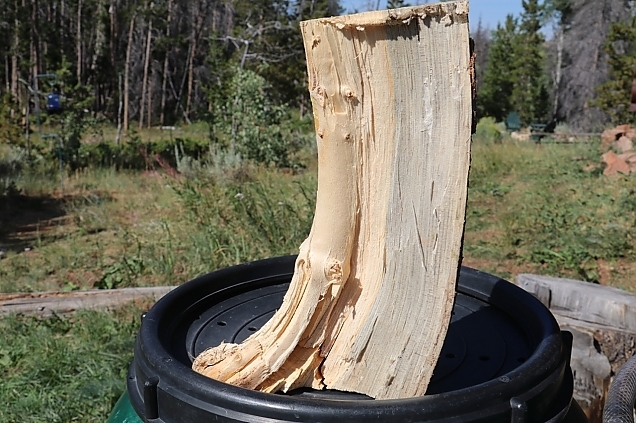 Then, I guess, tip it back up, reconnect the propane, check for leaks, etc., and try to start it again. Whoa! I think I need professional help! Not sure where that is going to come from. I wrote Tim at Unique an email expressing my frustration. And, I'll call Suburban Propane's Tim on Monday and beg for help. Meantime, that fridge is sucking electricity like crazy. Could just run the generator, right? But, it is still not fully hooked up. So, we are praying for long, sunny days and conserving as much as possible. I'll update this post in the future to complete the story. Meantime, here is what our new appliance look like (mostly) installed. The fridge still has protective film on it and I don't want to take that off until I'm done tipping it over. Today, we got up a bit early, showered, fed the dogs, brewed some coffee, and took off in Big Red (our 2002 Suburban) for the "big city". 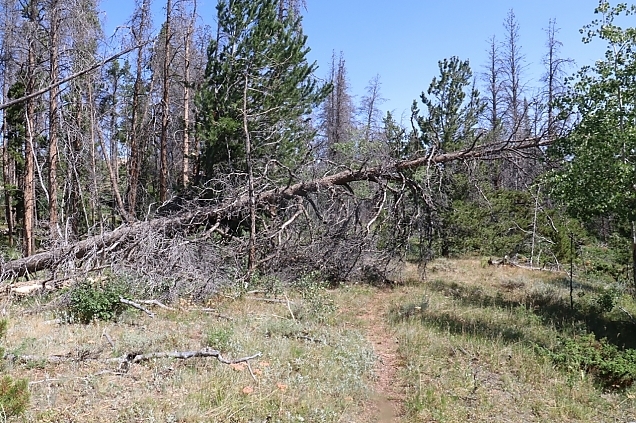 We took Cherokee Park Road to Highway 287 and then down to Fort Collins. The goal of the day was to get our Colorado driver's licenses and register Big Red. I had done a lot of web research and thought we were in pretty good shape (with a few exceptions). First stop was the emissions testing facility who could also provide us with a VIN verification, needed for the truck registration. Next stop was the DMV to get our licenses. I knew we needed to establish our identity (passports worked for this); legal driving credentials (our NJ license worked for this), and our residency. And, for some reason we had to show that our Social Security number was, in fact, ours. 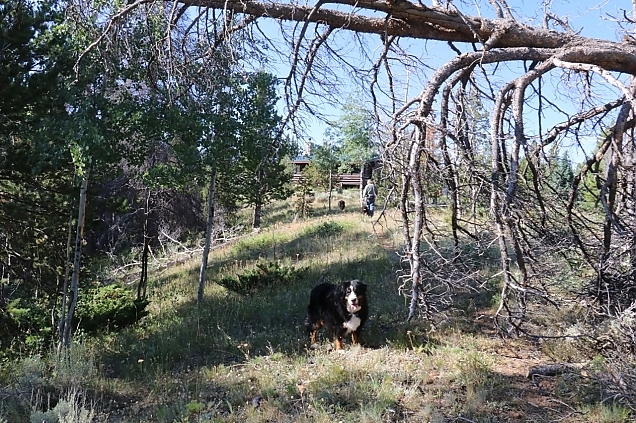 Establishing residency--that we are living in Colorado--was the stickiest issue. Typically, they want at least two forms of proof of residency and they have to be within the past 12 months. Utilitity bills, rent receipts, etc. all work. Really, almost anything that is mailed to YOUR NAME at YOUR ADDRESS is okay. Nothing gets mailed to our address. 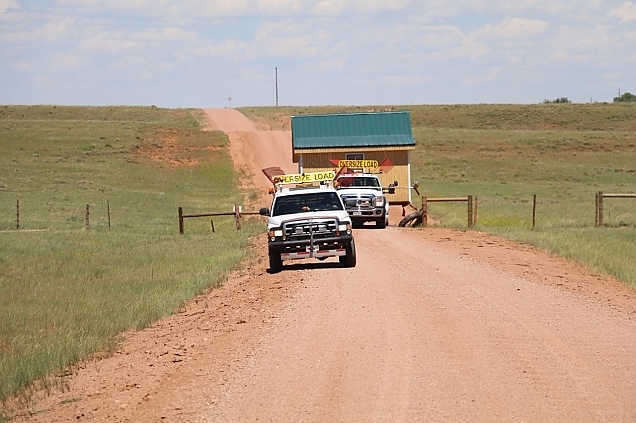 Remember, there is no mail service to our Colorado address. 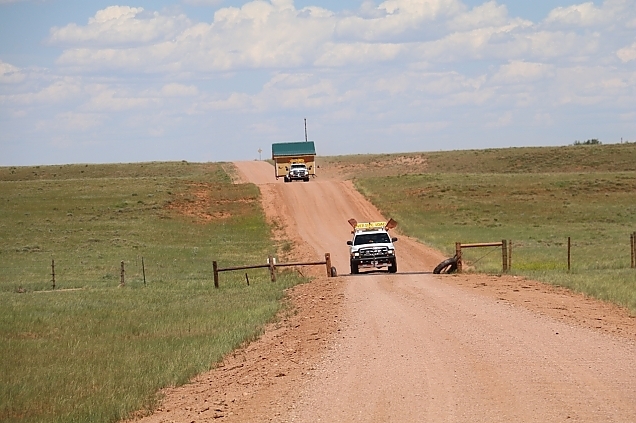 Instead, we get our mail on a rural route in Wyoming. Hmmm. I was able to show my W2 with my legal name and Social Security number on it. Check. Passport to establish ID. Check. I had an invoice from our home owners insurance that showed the "covered address" and it was addressed to both Lynne and me. Check. And, I had a property tax notice that, of course, had the physical address. Check. I was in! Lynne happened to see a different "agent" and that did not go as well. First, she has no proof of her SS number. How many people still have that little cardboard card with their number on it? And, she had no W2 or other proof of her SS number. However, she was "still in the system" from having had a driver's license in Colorado 10 year ago, and they accepted that. Along with her passport, ID was established. Check. The problem was that the same documentation that got me through, did not work for Lynne. Turns out the tax notice (along with some other documents like building inspections, etc.) were all addressed to our living trust, not us as individuals. My agent had accepted that, but Lynne's (and the supervisor) did not. We did not have that second piece of documentation that Lynne lived at our address. I got a bit hot under the collar about this. "I got my license. I used these documents. Why can't she also use these documents? She is my wife! She lives with me!" Nothing worked. They would not budge. They suggested we go to our bank and have them print some kind of document that showed our physical address (since they are required by law to have it). But, all our bank accounts are associated with the living trust. Won't work. I kept jumping back to the front of the line to suggest another alternative to the supervisor. "What if I write a rental agreement here on a piece of paper, renting our property to Lynne? Then, I sign it and she has the document she needs?" (This has worked for others, we hear.) Nope, it would have to be a legally drawn up agreement, etc. etc. 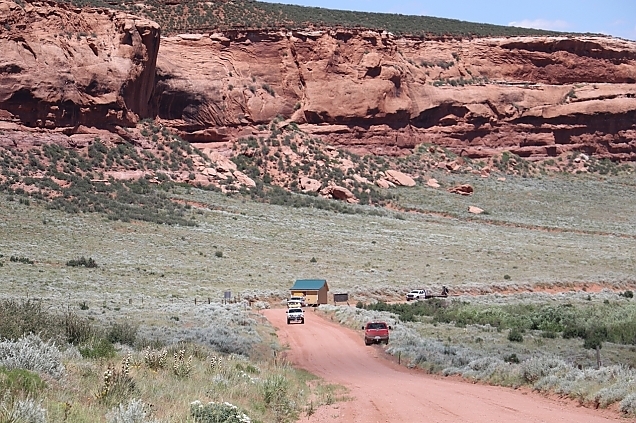 Finally, the supervisor saw our Colorado State Farm insurance card for Big Red, that I had in the same stack of papers I was riffling through to try to prove that my wife lives with me at our home with no mail service to its legal address. He suggested that I call my insurance agent and have them print out "something" that shows both our names as well as both our addresses (legal and mailing). I called our agent in Loveland. She emailed me a screen shot from her computer that showed this info. I took my phone up to the front of the line and showed the email message to the supervisor. He bought it! Actually, I think he was pretty sympathetic to our problem (off the grid, no mail service to our legal address, mailing address in a different state, stuff in my name instead of both our names, the trust owning most assets, etc.) and just wanted to get rid of me. (People were getting irritated that I kept jumping the line to talk to him.) I don't think he even looked at the email message. Click, click, click on the keyboard and Lynne had her license. Lunch at Culvers. Washed the truck. Gas at Jax and we headed home. Next step is to register Lex. But, that should go well given we've learned the ropes. We now have (temporary) Colorado driver's licenses! 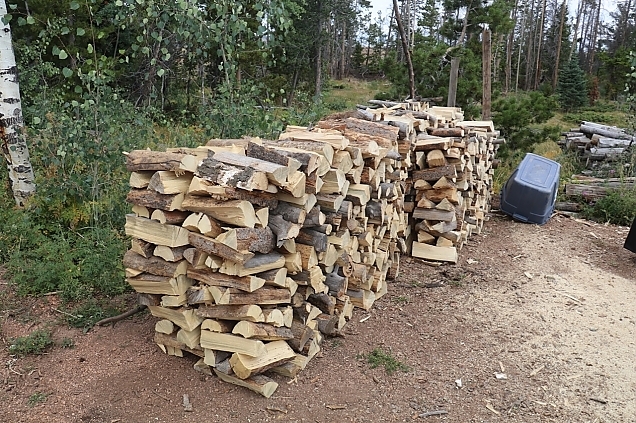 I figure we'll need 7 to 8 cords of wood for winter. And, maybe a bit more "around the edges" at the start and end of colder weather. So, the strategy is to put up a cord of wood each week during August and September, and then opportunistically cut more if we get the chance. 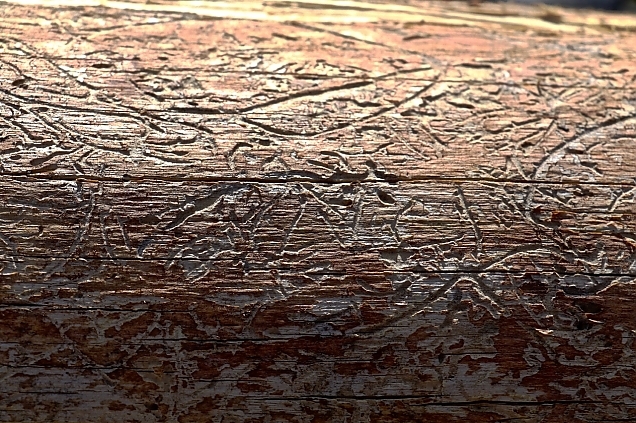 A cord of wood is 128 cubic feet of wood. 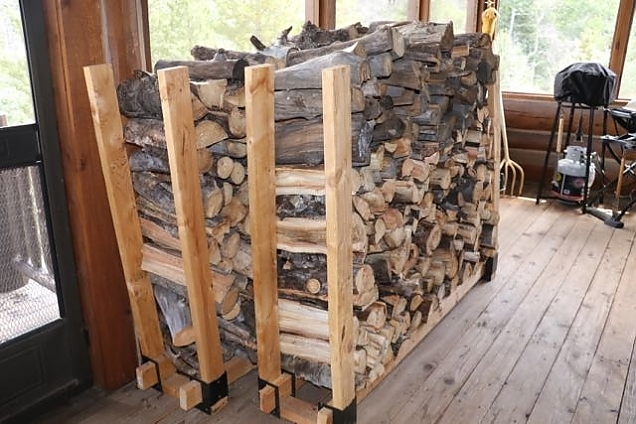 This is usually figured as three rows of 16" logs stacked 8 feet long and 4 feet high. 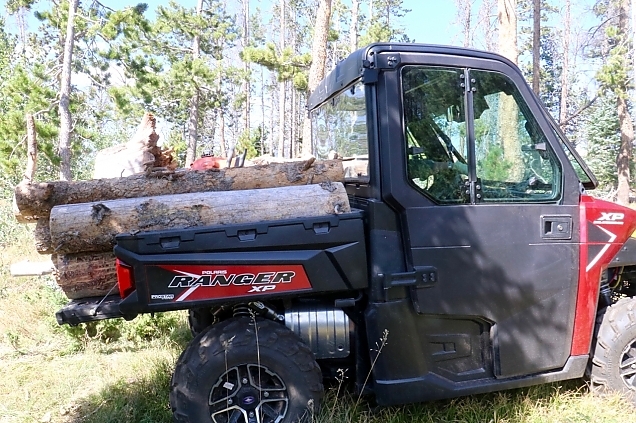 That's 4x4x8 or 128 cubic feet. 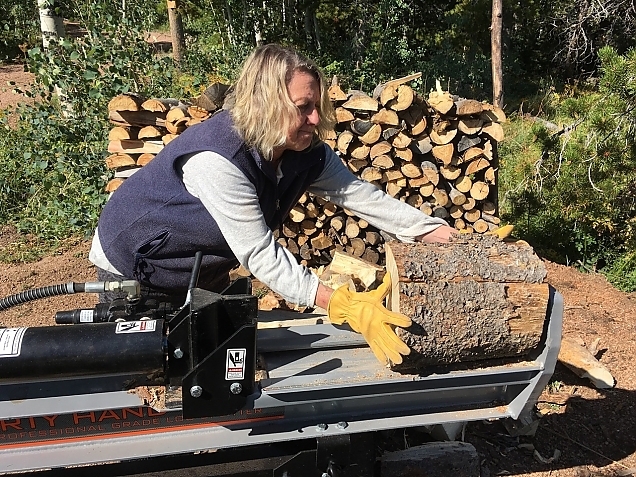 A few days ago, Lynne donned her overalls, I got out the saw and fired up the splitter and we did a cord. Two-thirds of it is stored on the front porch (which my "fire wise" friends will point out is a bad idea, but when it is -20° outside and the wind is howling, it is nice to have a stash on the porch). The other 1/3 is in a temporary stack awaiting the construction of a wood shed. The final third stacked. More to join this stack soon! 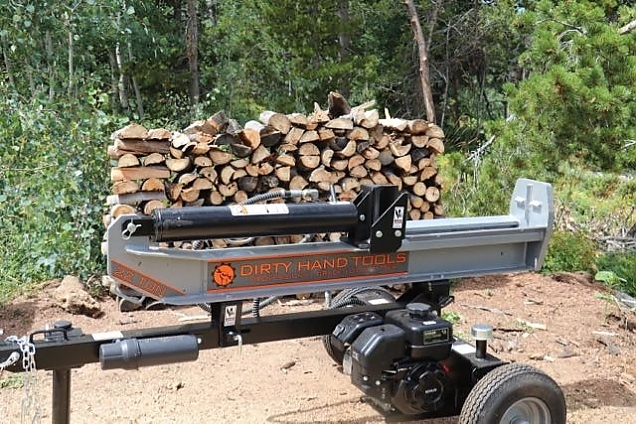 We love our new log splitter (built right here in Colorado). It works like a charm. 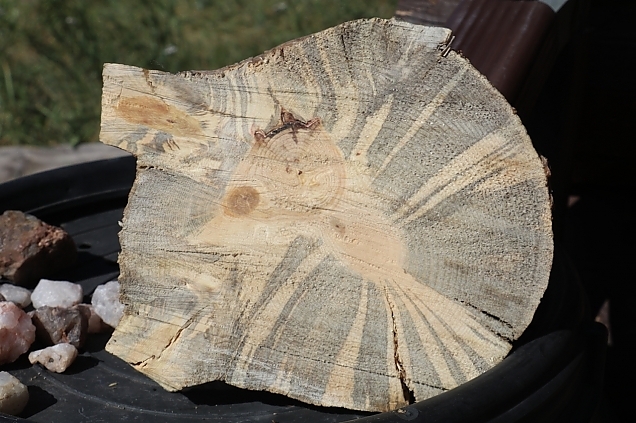 The next step is to sharpen the blade on the chain saw and do another cord this weekend. Our barn finally arrived on the 6th of July. I was going to blog about it right after it was delivered, but I've been lazy. I guess that's my excuse. Doesn't it look great in its spot? Let's back up a bit and show you a little bit of the process of getting it here and getting it down our driveway. 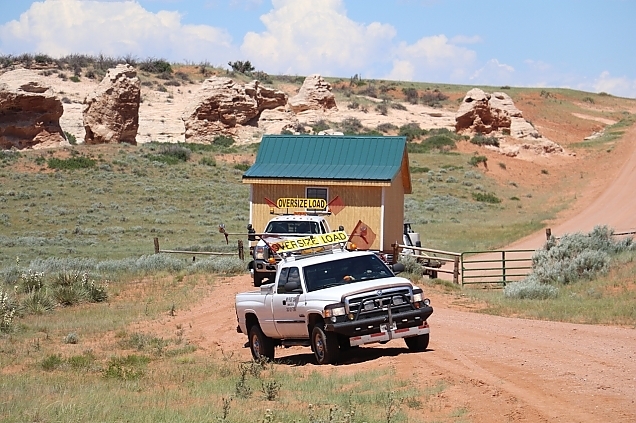 Phil from Rocky Mountain Storage Barns in Ft. Collins had come up a few weeks earlier and traced the path, measuring the width of the cattle guards and making sure the barn would have safe travels. 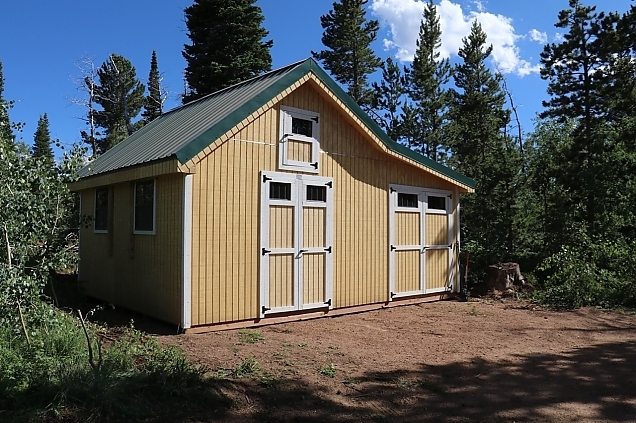 The barn was fully assembled in Ft. Collins all 20' x 14' of it, so it was quite large. And bigger and it would not have made it here. At least not in one piece! 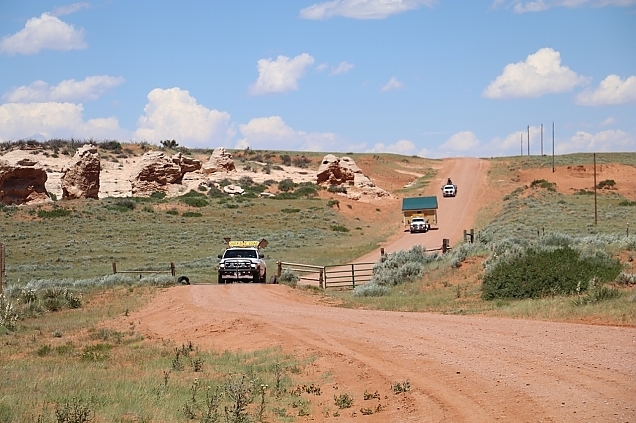 They called us when they arrived in Laramie and turned down Sand Creek Road. Rick and I drove out to meet them. Here are some shots from along the way. When we first saw it coming down the road. 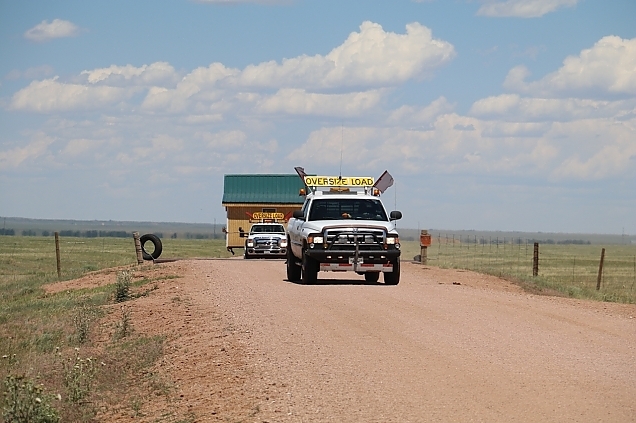 Making the turn at Wooden Shoe Ranch through the cattle guard. Kind of a tight fit through this cattle guard. On the Colorado side now. And arrival at the top of the driveway, finally! And that was the easy part! 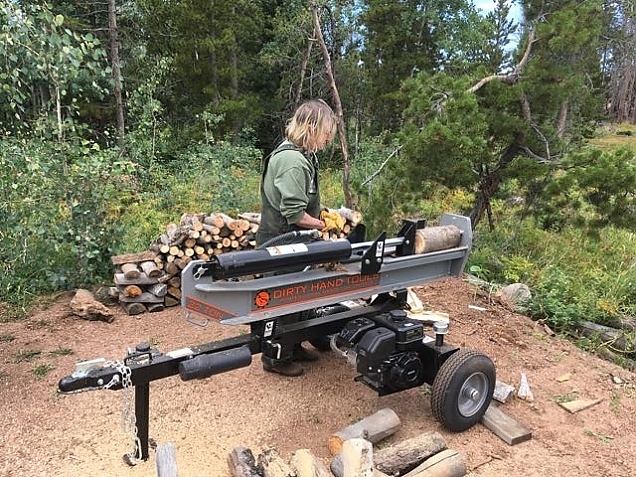 They loaded the barn off the trailer and got the Mule out, which is nothing more than a glorified fork lift but a very cool piece of equipment. 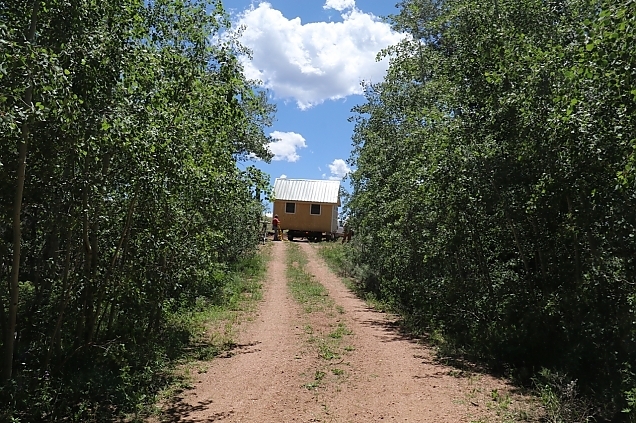 It was very tight getting the barn down the driveway and we had to take out some smaller aspens but nothing major. It took them about an hour and twenty minutes to get the barn down and in place. I can't say enough about the professionalism of Phil and his crew. They did a great job of getting the barn here and in its place. We love it! Here is a short video of the last part of it.